Non-covert cameras are designed to create paranoia, not to catch criminals. "We're looking out for you!" boasts a cheerful poster at a suburban shopping mall, the powers that peek exulting in their triumph over their guests' personal liberties. No-one seems to mind  they're used to it. Over the past decade, closed-circuit security camera systems have fallen drastically in price and increased enormously in popularity. The term closed-circuit simply means that the signals picked up by the cameras are not broadcast, but fed to monitors by wires. The main reason the spy camera industry is booming so massively is that the technology of closed-circuit cameras has increased by leaps and bounds. Gone are the bulky, low-resolution black-and-white surveillance systems most common in the 80s and early 90s. Typical now are high-resolution, full-colour systems that function with cameras that fit in the palm of one's hand. In a manner horribly reminiscent of George Orwell's 1984, cameras are popping up in virtually all public and semi-public areas, including government buildings, hotels, office towers, factories, recreation centres, shopping malls and commercial enterprises of all varieties. The 1990s will most likely be the last decade in which it feels unusual to be watched by a surveillance camera while indoors. Increasingly, cameras are beginning to pop up outdoors. Roads have been watched for a while now, with varying degrees of success. A more recent innovation is the surveillance of public walkways. I was recently surprised to stumble upon a new "This Area Under Surveillance" sign while walking across the York University campus. I was on the verge of dismissing the sign as a lie when I spotted the camera peering down on me from far away atop the roof of a 15-storey building. I got chills. Factories, offices and shopping centres have begun to add bionic eyes to the outsides of their buildings so they can peer out at their surroundings, the latest development in the ongoing evolutionary process by which institutions shall become organisms. Surveillance is a sad fact of modern exploration  so read carefully. For the most part, the watchers are not subtle, nor do they appear to be ashamed of themselves. In fact, the majority of cameras seem designed not to catch true criminals, who can easily spot the cameras and work around them, but to intimidate ordinary people into being on their best behaviour. The true purpose of non-covert cameras is made obvious by the very fact of their blatancy. One of the most obvious examples is the incredibly popular tinted dome camera, which comes in a wide variety of shapes and sizes, for mounting on walls or ceilings. 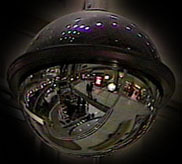 Dome cameras give the impression of constant 360- degree surveillance, but usually just contain a normal camera looking in one direction and struggling to peer through the tinted glass. In unusual lighting conditions, one can see where the camera inside a dome is pointing and sometimes the camera is aimed at a blank wall or staring off into space. Who knows if these cameras are turned on or if they're even real? Almost as bad are big bulky hanging cameras. In this age of cheap miniaturized electronics, these ludicrous relics serve no purpose other than to exclaim their presence in the most obvious way possible. Sometimes these will also feature blinking LEDs or even an accompanying monitor to further demonstrate the fact that all who pass are being watched. Only slightly less blatant than dome cameras and bulky hanging cameras are ceiling-mounted cameras, which are possibly the most common variety. These cameras hang from ceilings inside triangular casings, and often feature a red LED just to make sure they aren't too subtle. An important skill for any urban explorer to acquire is Camera Awareness. One should always know when one is being watched by a non-covert camera. Basically it's a simple matter of keeping your eyes on the ceiling, as that's where almost all cameras are installed. For practice, play "spot the camera" whenever you're out and about. You may be amazed. Covert cameras are so easily hidden that they could be watching at any time. Covert cameras are the next big thing. Currently being pitched by surveillance companies across Canada and the United States, these cheap, miniature spy cameras encourage paranoid shopkeepers and paranoid bosses to install systems that will breed paranoid customers and paranoid employees. Covert cameras are even more sinister than their sister species. Whereas non-covert cameras exist largely to intimidate and create fear, covert cameras are truly designed to gather images and information which private citizens would prefer to keep to themselves. In a world where a quality closed-circuit camera is the size of a microchip, it's almost impossible for us to ever be sure we aren't being watched. Of course, none of this is to say that should become so paranoid that you never again do anything outside the privacy of your own darkened bathroom. To a tremendous extent, cameras exist not to monitor, but to create an impression of monitoring. As any good agnostic knows, one cannot allow the impression of constant surveillance to prevent one from having a good time. Merchants across the nation are cheerfully lying to their customers with the full consent of the law. Since real security systems are generally too expensive for most small shops, dummy cameras, which retail for around $50, have become all the rage. These dummy camera systems generally include a supply of signs stating that the premises are being monitored by closed-circuit television. Whereas the cameras themselves are merely deceptive, the accompanying signs are flat out lies. In a bizarre twist on dystopian science fiction, the powers that be are ridiculously eager to convince us that they are violating our privacy, even though they aren't willing to shell out the cash to do it properly. In the near future we can expect to see large signs in malls reading "Big Brother is watching you. Honest." Fake dummy cameras aren't the only cameras to offer a false sense of security  often, when proper closed-circuit camera systems become obsolete or break (a fairly common occurrence when highly sensitive electronics are left outside), the security departments don't bother fixing them. They're still doing the job of intimidating people. After a recent incident at K-State campus in which a student assault was not caught on film, security chief Robert Mellgren admitted that only two of the campus' 10 security cameras were in working order. "Cameras don't protect people. People protect people," he explained, but added "people are scared of being caught on camera." In an interesting sidenote, courts have ruled that when cameras are in place, employees and customers have a reasonable expectation that they are "being protected". If someone is injured during a crime in an area "protected" by dummy cameras, the employer could very likely lose a costly security negligence lawsuit. Many fully functional cameras are really nothing more than dummy cameras. It is quite rare for an institution to have more than one person watching its closed-circuit televisions at any one time. In many situations, no-one is assigned to watch the monitors, as employers may view it as a waste of manpower and employees view it as a tremendously mind-numbing chore. Think of all the unmonitored camera banks you've seen yourself. It's incredibly rare for someone to actually sit and do nothing else but watch the monitors. Further, often one monitor flips between the input of a dozen cameras. This means one has a one-in-12 chance of being seen, if anyone's watching. This article originally appeared in Infiltration 3.